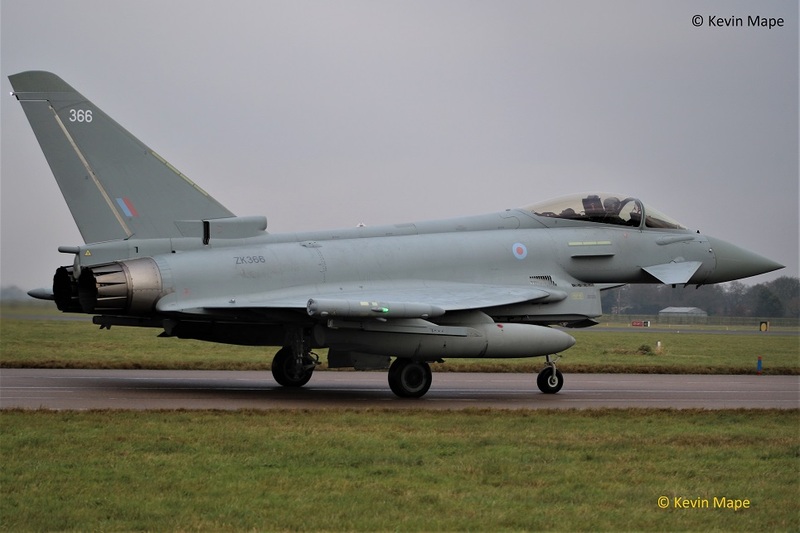 I will not be able to visit RAF Coningsby this month, I have just had a new knee fitted so will not be active this month. If you can send me a log from your camera in the order you take your pictures we can do a log from that, My e-mail address is kevin_good123@hotmail.com. I am just recovering from a knee replacement and will not make many visits to the base this month, So only a few pictures this month. ZK371/Unmarked c/s “************” – To Lossiemouth. AM Log thanks to Susie & Garf. G-MAJB/JB/Eastern/Jetstream 41 c/s “East Flt 102” in “103” out. ZK316/316/6Sqn c/s “Razor 14” – To Leuchars then returned. G-MAJB/JB/Eastern/Jetstream 41 c/s “East Flt 104” in “105” out. Echo – ZK308/308 code only. ASP – ZK342/342/6Sqn,ZJ912/912 code only,,ZK382/382 code only. ZK309/QO-P code only c/s “Razor 13”- Ground abort. 5th Wed Log thanks to Susie & Rich. ZK308/308 – Noted on the Washpan. ZK313/W code only c/s “Rafair 7001” – Landed. WK518/C/BBMF/Chipmunk T10 c/s “Chippy 98” – Aborted due to winds taxi back. AT01/Alpha Jet c/s “Belgium Air Force 101” – Parked on Sierra. n/s. AT18/Alpha Jet c/s “Belgium Air Force 102” – Parked on Sierra. n/s. 7th Thur Log thanks to Garf. AM Garfs log from 11-35. AT01/11Sqn/Alpha Jet c/s “Belgium Air Force 101” – Departed . XX316/CU-849/736 NAS marks/Hawk T1A c/s “Pirate 22” – parked on Sierra. AT18/11Sqn/Alpha Jet c/s “Belgium Air Force 102” – Departed. 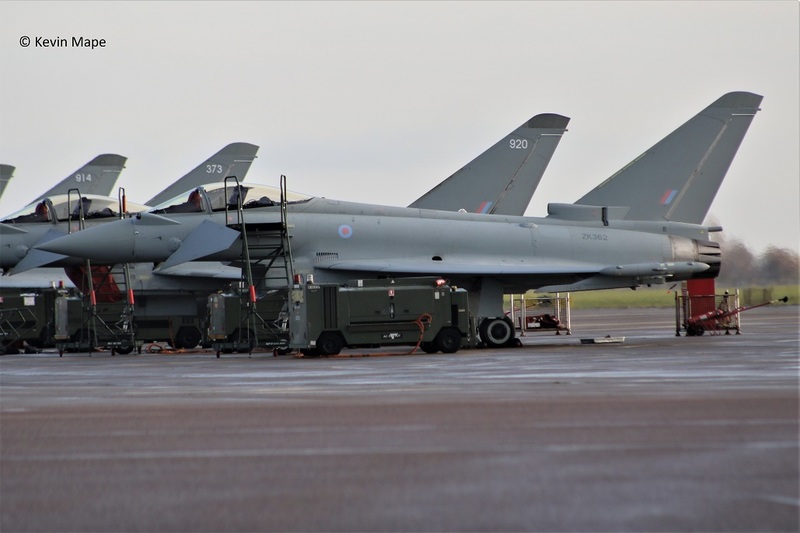 ZJ929/929 code only – QRA radio check.- 12-03pm. XX316/CU-849/736 NAS marks/Hawk T1A c/s “Pirate 22” -Departed. ZK363/Unmarked c/s “Rebel 58” – Delivery from Warton. 12th Tue Log – Big thanks to Steve, Val & Susie in the very cold weather !. ZK358/Unmarked Towed from south side TMF to ASP then back to TMF. ZJ802/DW/XI(F)Sqn – Towed from Foxtrot to paint shop. ZK458/D/45(R)Sqn/king Air B200GT c/s “Rafair 72**”.parked on Sierra. G-COBS/Cobham/Da-42 Twin Star c/s “Calibrator 96” parked on Sierra. ZK343/343/1(F)Sqn c/s “Lossie 01” – Parked on the ASP. 13th Wed Log thanks to Garf. WK518/C/BBMF/Chipmunk T10 c/s “Chippy 90” – Aerobatics. ZH897/Chinook HC6 c/s “Boeing 23” – Overfly to Donna Nook. ZK458/D/45(R)Sqn/King Air B200 GT Noted on Sierra. PM – Log thanks to Garf. ZK458/D/45(R)Sqn/King Air B200GT c/s “Cranwell 74” – Departed after night stop. ZK367/EB-R/41(R)TES c/s “Rebel 62” – PD Waddington. ZJ809/809 code only c/s “Lossie 58” – parked on the ASP. ZD980/DD/Chinook HC5 c/s “Vortex 590” – Parked on Sierra. “Pirate 17” – Parked on Echo. 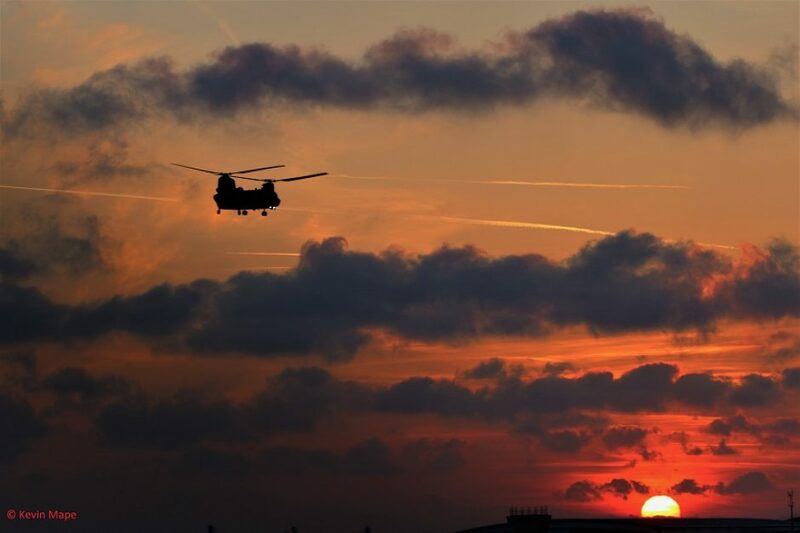 ZD980/DD/Chinook HC5 c/s “Vortex 590” -Departed. AM Log thanks to Susie. ZK348/348 code only – Noted on the Wash pan. ZA553/045 code only /Tornado GR4 c/s “Monster 2” – Overfly. ZF348/348/1FTS/Tucano T1 c/s “Sword 1”- Parked on Sierra. ZF491/491/1FTS/Tucano T1 c/s “Sword 2”- Parked on Sierra. ZJ929/929 code only Towed from Has 1 to Has 2 for QRA duty. 18th Mon Log thanks to Garf. ZK455/O/45(R)Sqn/King Air B200 c/s “Cranwell 73” – Landed with fumes in the cockpit. – To Sierra n/s. 19th Tue Log thanks to Steve ,Val & Garf. ZK456/P/45(R)Sqn/King Air B200 c/s “Cranwell 64” – with crew for ZK455 – Parked on Sierra. ZK313/W code only c/s “Rafair 7002” – Landed – to Foxtrot. 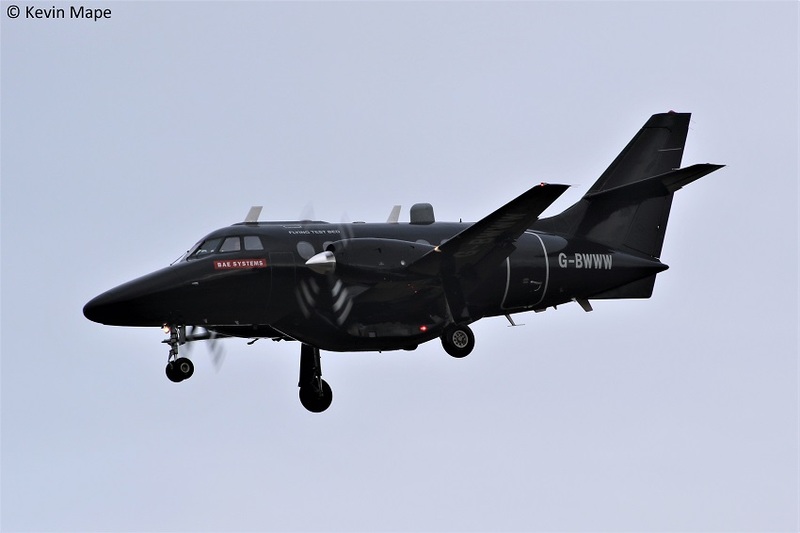 ZK456/P/45(R)Sqn/King Air B200 c/s “Cranwell 64” – Departed. ZK304/304 code only c/s “Nightmare 12” f/n as 304 ex FM code only. 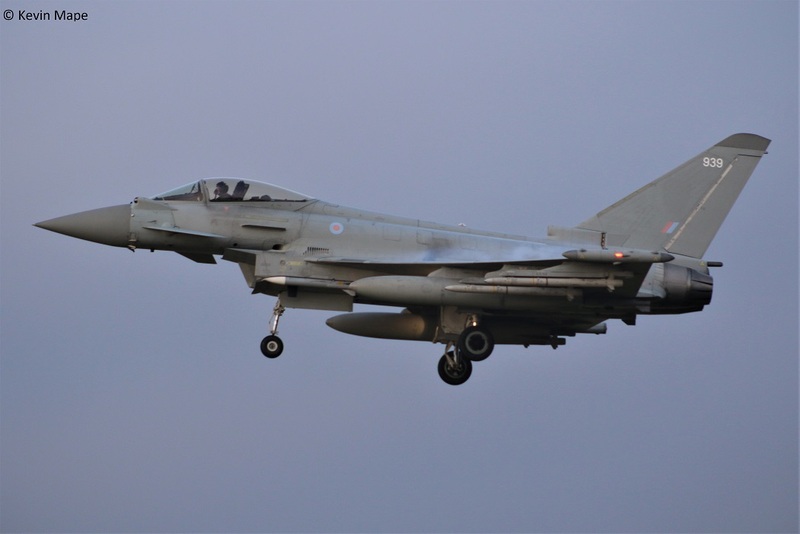 ZK300/300 code only c/s “Typhoon 101” – Delivery to Lossiemouth. ZK455/O/45(R)Sqn/King Air B200 c/s “Cranwell 77” – Departed. ZK357/Unmarked c/s “Tarnish 29” – Delivery from Warton. G-BWWW/BAe Warton/Jetstream 31 c/s “Avro 01” – Parked on Sierra – crew ferry – then to Warton. ZK460/U/45(R)Sqn Poppy marks /King Air B200 GT c/s “Cranwell 66”- Overshoots. Echo – ZK316/316/6Sqn , ZK366/366 code only. On QRA duty – ZK348/348 ,ZJ929/929 only , ZJ939/939 code only. ASP – ZK377/377 code only – f/n with code. ZK354/BY – towed to HAS 10 in Echo. ZK362/Unmarked c/s “Tarnish 29” – Delivery from Warton. G-BWWW/BAe Warton/Jetstream 31 c/s “Avro 01” – Parked on Sierra – crew ferry. ZK428/Unmarked c/s “Tarnish 69” – delivery from Warton. ZK354 : BY : code only – moved to XI(F)Sqn. TMF Hangar for December have included. ZK346 : ER : code only : Typhoon FGR4 : Flying with XI(F)Sqn. 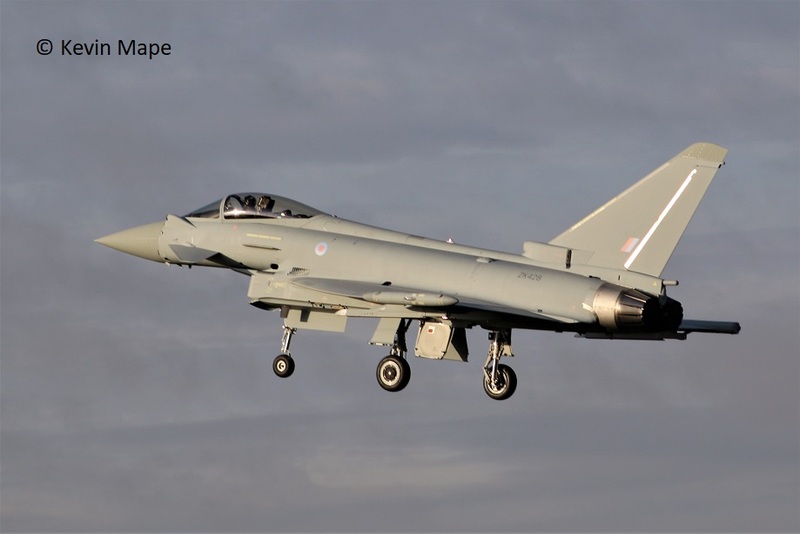 ZJ815 : Fuselage only : Typhoon T3 : Dumped outside HAS 58. ex 41(R)TES/EB-H.
ZJ809 : 809 : code only : Typhoon T3 : awaiting RTP.